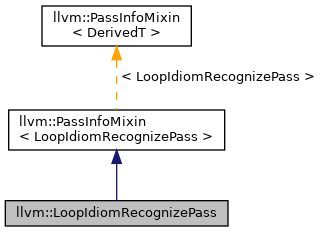 Performs Loop Idiom Recognize Pass. Definition at line 27 of file LoopIdiomRecognize.h. Definition at line 240 of file LoopIdiomRecognize.cpp. References llvm::LoopStandardAnalysisResults::AA, llvm::PreservedAnalyses::all(), llvm::LoopStandardAnalysisResults::DT, llvm::Module::getDataLayout(), llvm::LoopBase< BlockT, LoopT >::getHeader(), llvm::getLoopPassPreservedAnalyses(), llvm::BasicBlock::getModule(), INITIALIZE_PASS_BEGIN(), INITIALIZE_PASS_DEPENDENCY, llvm::LoopStandardAnalysisResults::LI, llvm::LoopStandardAnalysisResults::SE, llvm::LoopStandardAnalysisResults::TLI, and llvm::LoopStandardAnalysisResults::TTI.